NASA's Cassini spacecraft has captured the highest-resolution temperature map to date of Saturn's moon Mimas, and it found Pac-Man. Mimas, one of Saturn's many, many moons, is notable for several reasons. According to Wikipedia, it's the "smallest known astronomical body that is thought to be rounded in shape due to self-gravitation." For a sci-fi nerd, Mimas is notable because its singular prominent crater immediately brings to mind the Death Star - that's no space station, that's a moon! Now, NASA's Cassini spacecraft has taken temperature-map photos of Mimas that give it another claim to fame: It's secretly Pac-Man. Specifically, it's Pac-Man eating a dot, as seen here to the right. I mean, that's unmistakably the classic videogame icon right there. I wonder if they'll find Inky, Blinky, Pinky and Clyde on any of the other moons while they're at it? 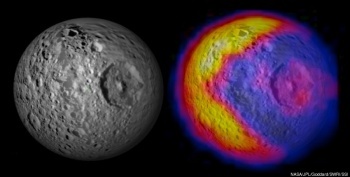 Scientists working with the composite infrared spectrometer, which mapped Mimas' temperatures, expected smoothly varying temperatures peaking in the early afternoon near the equator. Instead, the warmest region was in the morning, along one edge of the moon's disk, making a sharply defined Pac-Man shape, with temperatures around 92 Kelvin (minus 294 degrees Fahrenheit). The rest of the moon was much colder, around 77 Kelvin (minus 320 degrees Fahrenheit). A smaller warm spot -- the dot in Pac-Man's mouth -- showed up around Herschel, with a temperature around 84 Kelvin (minus 310 degrees Fahrenheit). As it turns out, Pac-Man is defined by temperatures at a balmy -294 F. No wonder he eats so much - gotta stay warm somehow! I wonder if Richard Garriott will try to lay claim to Mimas, too.